The International Monetary Fund (IMF) has downgraded its forecast of the South Korean economy's growth for this year to 4.1 percent from the 4.2 percent it predicted five months earlier, citing global financial turmoil, a growing trade deficit and rising commodity prices. In a country report, the IMF upped the figure for next year to 4.3 percent, expecting South Korea's economy will regain momentum early next year along with its major trading partners. In April, the lending agency put South Korea's estimated growth rate for 2009 at 4.4 percent. 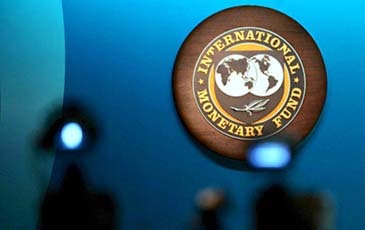 The IMF's projection is the lowest among major international and South Korean think tanks and organizations, with the Organization for Economic Cooperation and Development (OECD) having slashed the number to 4.3 percent from 5.2 percent in June. South Korean officials still say they can achieve at least 6 percent growth this year, although they acknowledge they cannot meet South Korean President Lee Myung-bak's campaign pledge from last year, a target rate of 7 percent. South Korea's economy, the world's 13th biggest, grew 5 percent last year. "Risks are mainly external and on the downside, but a volatile domestic political environment also clouds the outlook," the report said, referring to months of street rallies over U.S. beef imports that dogged the fledgling pro-U.S. Lee Myung-bak government. "The administration's ability to implement its economic agenda, which aims to raise its potential growth, may be restricted in the immediate aftermath," the report said. "A fractious political environment exacerbates the uncertainty in the outlook." Added to the political risk are recent reports that North Korean leader Kim Jong-il collapsed and is recovering from a stroke or cerebral hemorrhage. The report said South Korea's economy has demonstrated resilience in the face of the global financial turmoil, but has not escaped unscathed. "Stock prices have declined; financial market volatility has increased; spreads on external debts have widened; and the won has depreciated by around 7.75 percent against the dollar and by around 13 percent in real effective terms so far this year," it said. "A sharper or more prolonged global slowdown or further volatility in global financial conditions would have a significant impact on Korea's growth." It forecast that South Korea will suffer from a current account deficit of around 1.25 percent of gross domestic product this year, and 1 percent next year. "While the services deficit remains large, as Koreans continue to travel abroad, including for education, both trade and service balances have improved in recent months owing to a weaker won," it said. Despite solid export growth, higher commodity prices have led imports to rise even more sharply while the services account deficit remains sizable, the report said. "In the rest of 2008, continued slow global growth is likely to constrain exports and investment while high food and fuel prices limit consumption gains." It noted global higher commodity prices put inflation pressure on South Korea, but added that inflationary pressure should ease as growth slows. The IMF still advised South Korea to focus on keeping expectations for inflation at bay. "A rise in policy interest rates would be appropriate at this time, with potential scope for more accommodative policy later, should inflation moderate and the economy remain soft," it said. The global lending agency dismissed concerns over the recent fall in the South Korean won, saying the Korean currency still well represents its market value. "Korea's flexible exchange rate has served the country well in the past and continues to be appropriate with any efforts to influence the value of the won for an extended period of time likely to be costly and ineffective," it said.